It’s been awhile since I’ve been to La Gran Terraza! In fact, my last visit here was back in 2012 which was also for the upcoming San Diego Restaurant Week which starts THIS SUNDAY September 23rd. 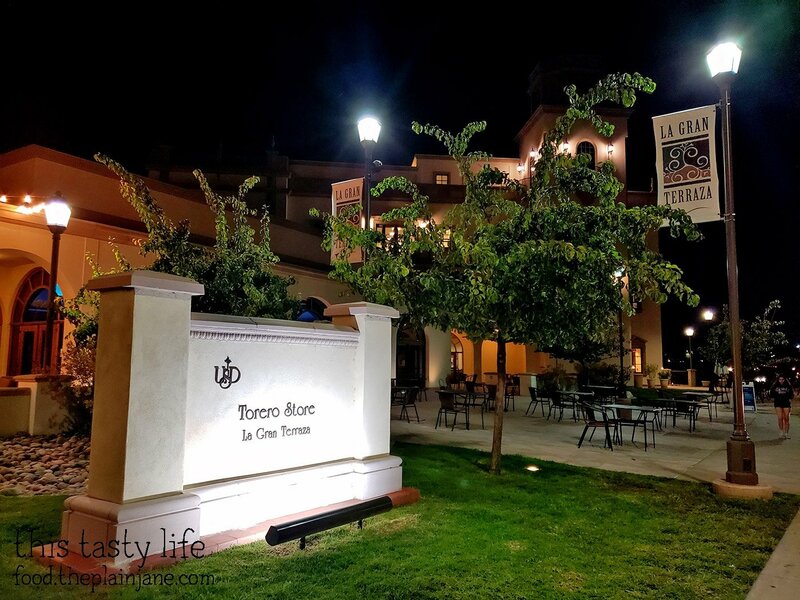 La Gran Terraza is a nice restaurant that’s tucked away inside of USD’s campus in Linda Vista. It’s not too far from the Student Pavilion. You can look for this sign to sort of guide you on the way. Jake and I visited on a Friday night. There was… I believe…. 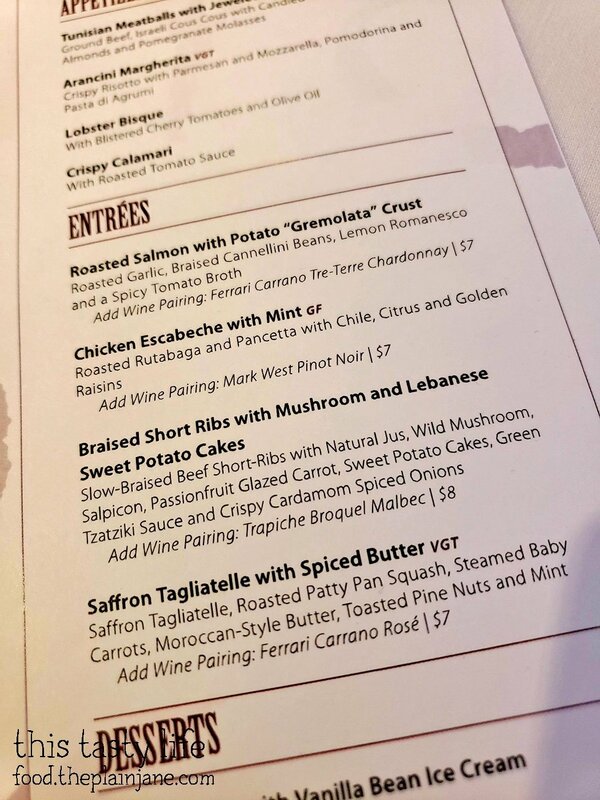 only two other tables that had guests at them.La Gran Terraza’s popular night of the week is Wednesday when they have a Prime Rib buffet for $23.95. 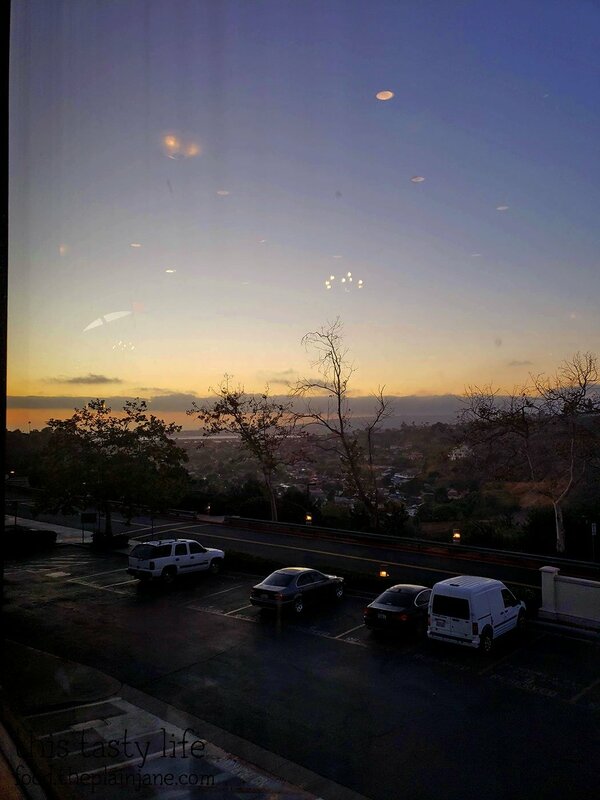 We were seated next to a window so I got to watch the sky as the sun set. La Gran Terraza also has a nice patio if you want to sit outside. The view from the patio is also pretty nice. 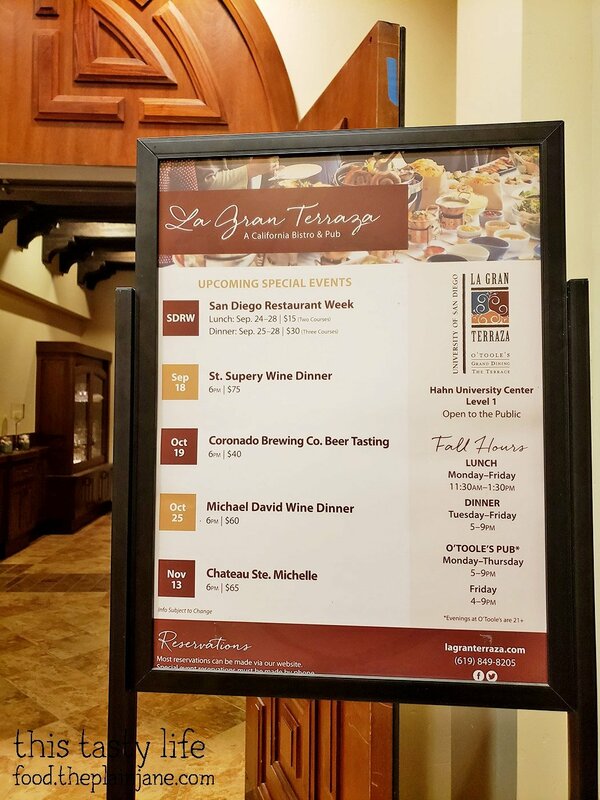 I was invited to La Gran Terraza to sample the San Diego Restaurant Week Dinner menu. It’s a 3 course meal for $30. 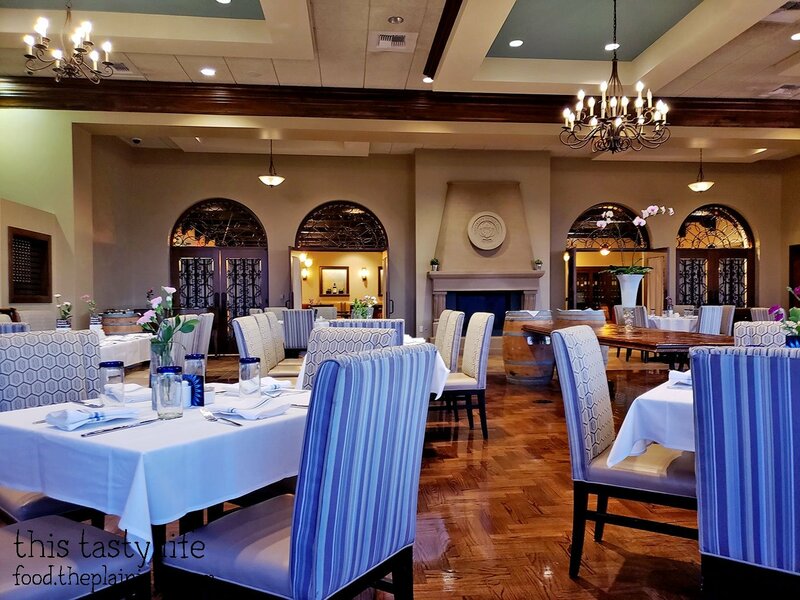 They also offer a $15 lunch menu for Restaurant Week which you can find here. And let’s not forget that dessert is included! What I like aboutLa Gran Terraza is that the menu changes from time to time and this is a completely different menu from when I visited back in 2012 so it was all new things to try. They change their menus seasonly. 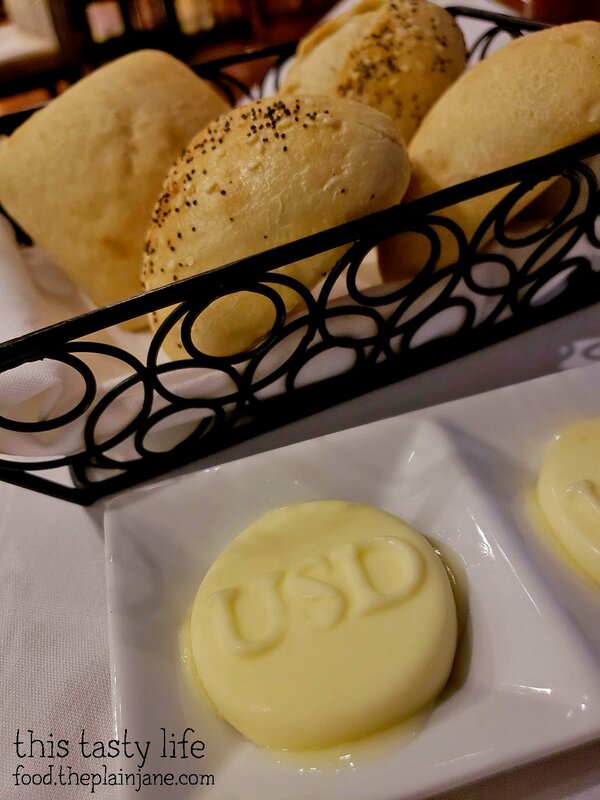 After we placed our orders, we got a little basket of bread along with their cute USD branded butter. For my first course, I choose the Crispy Calamari. It came with a little cute saucer full of delicious roasted tomato sauce. 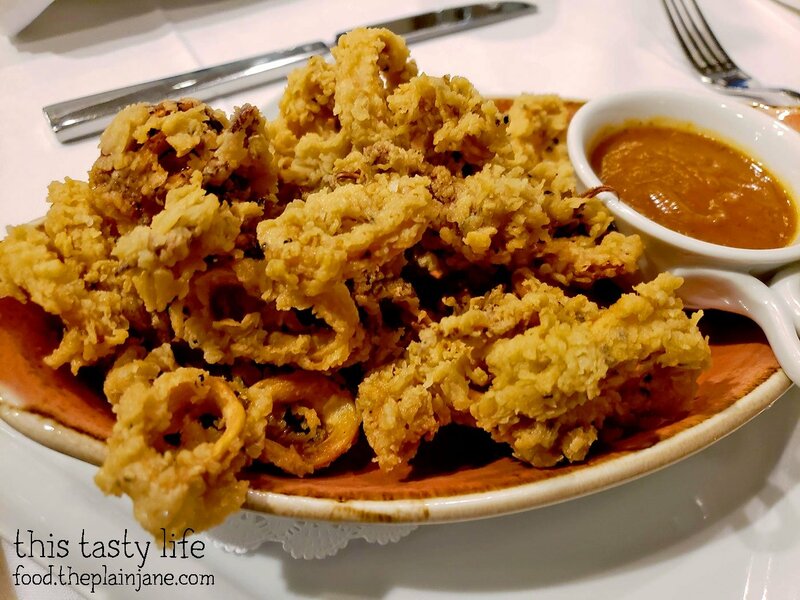 The calamari had a extra crispy coating and was delicious with the tomato sauce. The tomato sauce was kind of creamy, too, almost like a tomato bisque soup. 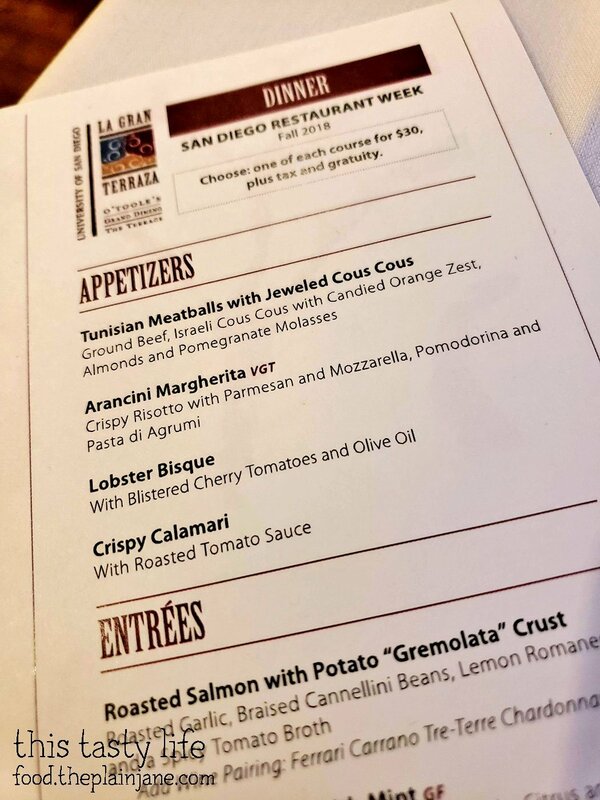 While I really liked my calamari, I have to say that the Arancini Margherita was really the winning appetizer that evening. 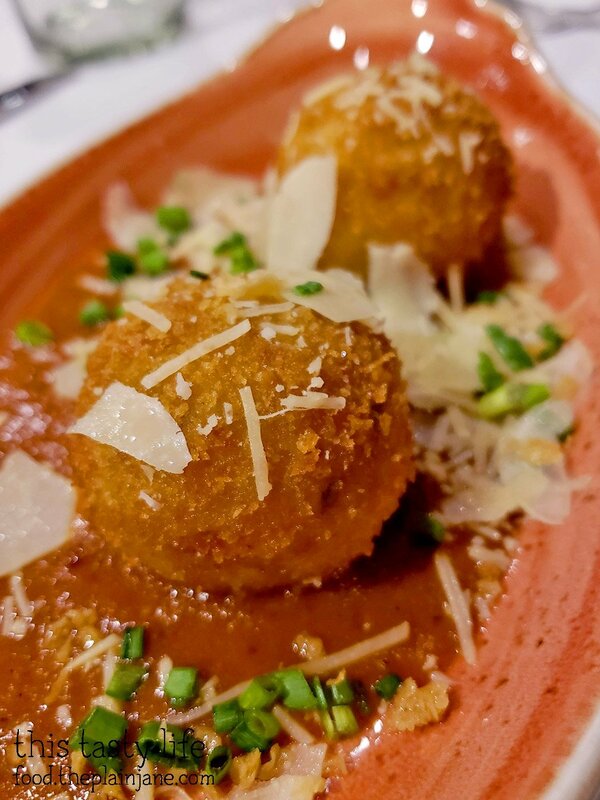 It’s a crispy ball of risotto mixed with parmesan and mozzarella cheese in a lovely pomodoro sauce. The first bite I had of this was HEAVEN. The exterior was crispy and crunchy, the interior was smooth and silky and full of wonderful cheese and risotto. The desire to steal this and devour it all for myself was STRONG but hey, it wasn’t even my appetizer! Jake was nice enough to give me a few bites though. He must love me. For my entree I choice the Saffron Tagliatelle with Spiced Butter. I was feeling like going vegetarian that evening! 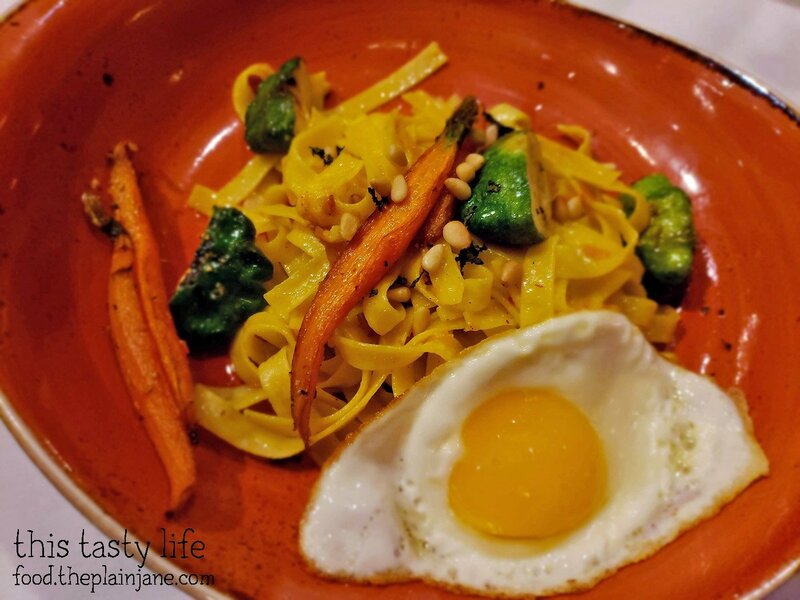 I got a pretty bowl full of pasta with steamed baby carrots, roasted pan squash, toasted pine nuts and a fried egg on the side. The egg was a surprise since it’s not listed on the menu. I actually cut the egg up and mixed it into my pasta and it sort of acted like the “sauce” since there really is no sauce on this dish. The saffron isn’t too heavy handed (though Jake didn’t like it) but I still felt like this lacked some flavor. I also wasn’t a big fan of the squash, and normally I really like squash. But these were a bit on the bitter side for me. Overall… I thought this was kind of a “meh” dish. For me, I wished it had more flavor, or a little tomato sauce or something to brighten it up. Jake got the Braised Short Ribs for his meal. Normally it comes with mushrooms but he asked for those to be left out. Jake won again with this short rib dishes because holy goodness the short rib was GOOD. 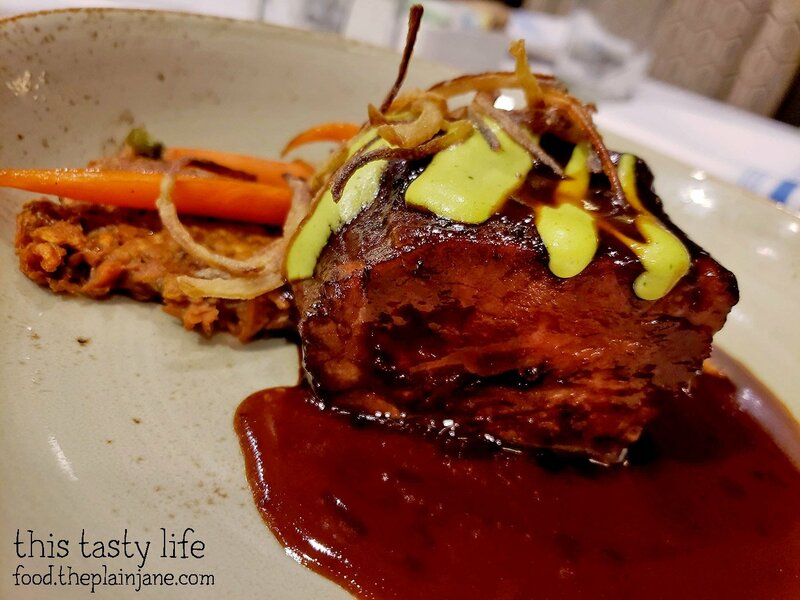 Sometimes short ribs have a really rich sauce on them but this one didn’t overpower the dish and the short ribs were so tender and full of flavor. Jake gave me a nice chunk which I added to my pasta and it made my pasta taste a lot better. Winning dish right here! 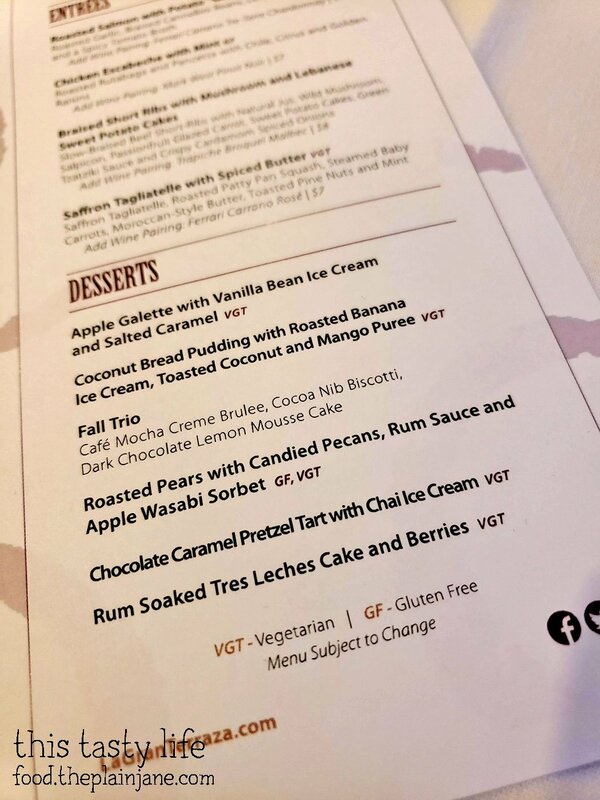 I won the dessert round though with my dessert choice – the Chocolate Caramel Pretzel Tart with Chai Ice Cream. 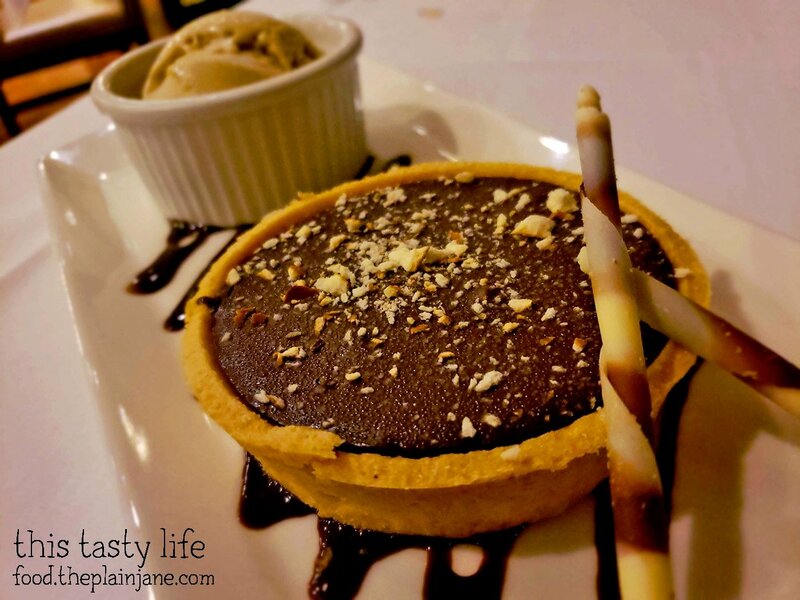 The tart crust was really nice and held up well against the chocolate filled tart. It was like caramel on the bottom with a chocolate filling on top. 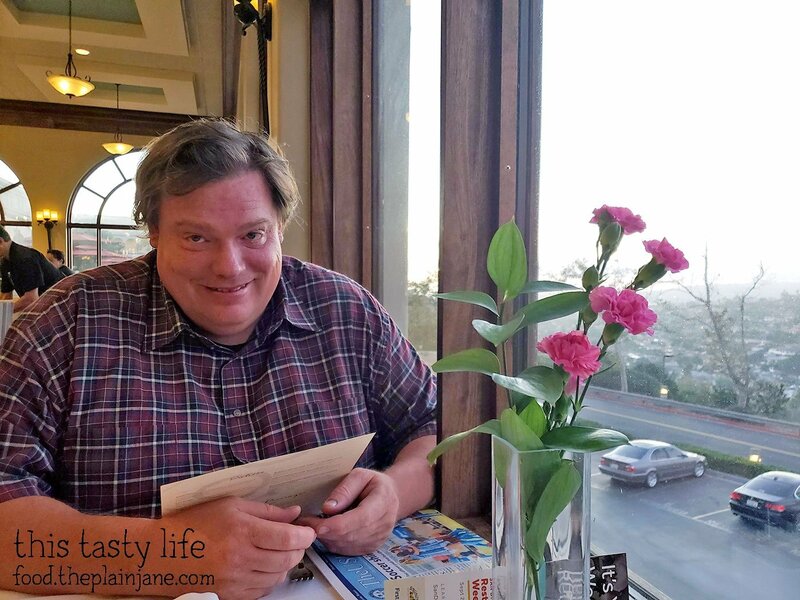 The chai ice cream on the side was also really really good – I loved the flavor it! I didn’t even eat them together. I kept them separate. Both were so tasty. 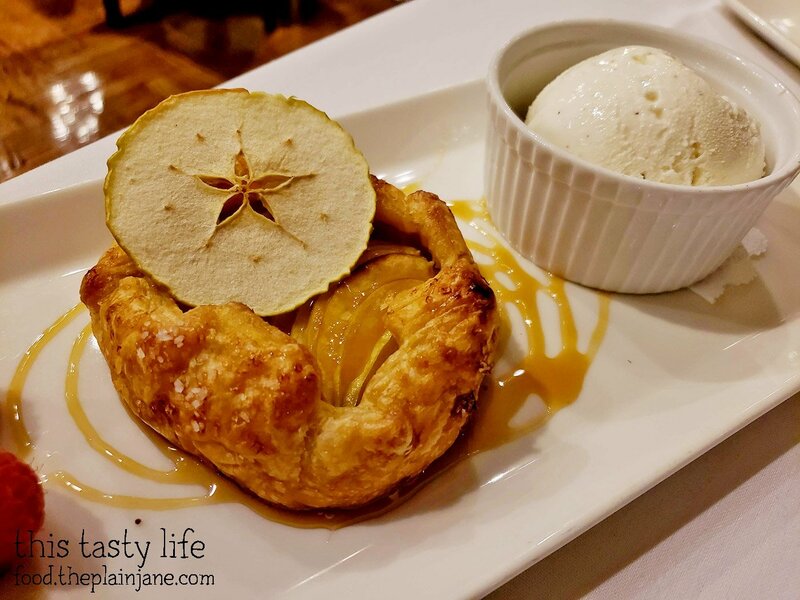 Jake got the Apple Galette with Vanilla Bean Ice Cream. I didn’t care for the galette myself. The crust was kind of chewy and soggy and I like things that are crisp so this didn’t do it for me. But Jake seemed to like it quite a bit and he’s a vanilla ice cream kind of guy anyway, so this worked for him. Jake picked most of the good stuff off the menu this time (omg those short ribs) but I still enjoyed some of my choices as well! 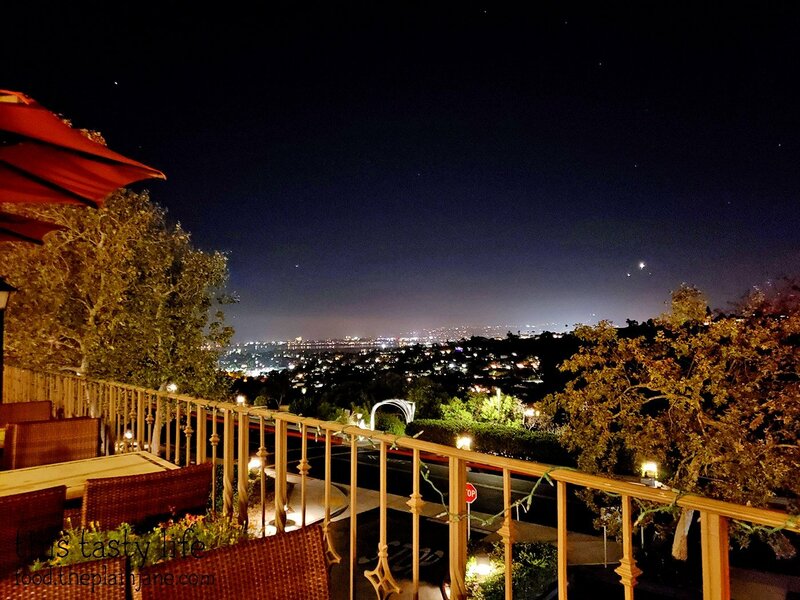 The dishes here are unique and you feel like you’re in a nice fancy restaurant on a special date that’s…. on a college campus. If you decide to come visit La Gran Terraza for dinner, please note that they’re only open Tuesday through Friday for dinner! Lunch is Monday through Friday as well, so nothing on the weekend. Sorry! But it’s still worth it and I recommend checking it out for something a little bit different! Disclaimer: I was invited to dine at La Gran Terraza and my meal was complimentary. I was not further compensated for this post and all opinions are my own. hi mary! is this that student run and/or chef training spot at USD? i thought there was a place like that… anyway, glad you guys had a great meal. those arancini balls sound so good and we like getting short ribs too. when it is SDRW, i’m always hoping that the majority of our food turns out well. at least we are getting a reduced price while trying out something new! No this isn’t the student run one. 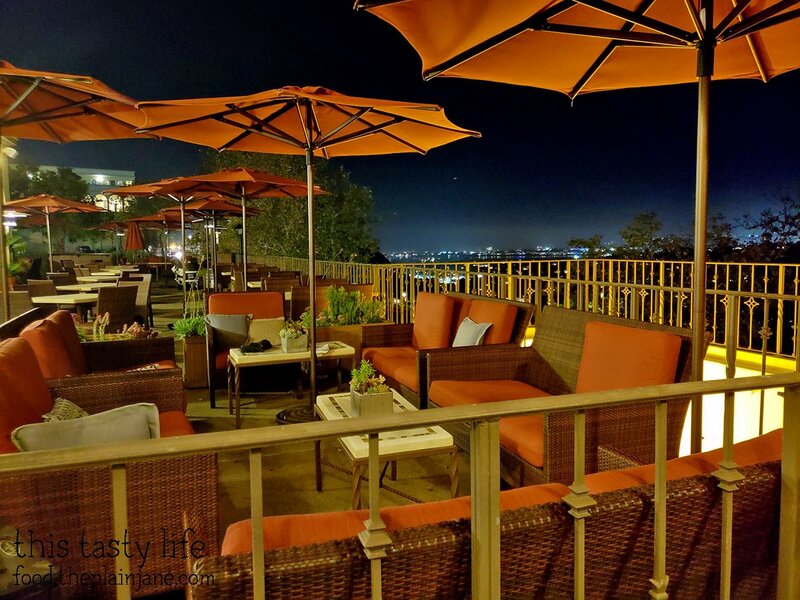 Maybe you’re thinking of the Palette at the Art Institute (see: https://www.yelp.com/biz/the-palette-san-diego-3) – I’ve been wanting to go check that out actually! Seems like a great place to go and just enjoy! I love it. Hi Kelly – it is quite a nice spot! Thanks!